So first, you've to apply for SET (Entrance exam for Bachelor's). Then they set a cut-off. Students who score above the cut off are short-listed for PI-WAT (Personal Interview, Written Ability Test). They call you for an interview either in Delhi or Pune. The SET score constitutes 30 %, PI-WAT constitutes 60% and 10th and 12th grade constitutes 10 %. Cut-offs differ from year to year. Eligible: More than 45% in 12th. You will have to give SET(SYMBIOSIS ENTRANCE TEST). It varies according to your PI-WAT, Personal Interview. 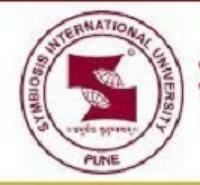 Can you provide more information about the courses at Symbiosis Institute of Computer Studies and Research, [SICSR] Pune?